Michael Aspel's team of experts assess antiques. They visit Chichester Cathedral and are excited to see an original manuscript by 19th-century adventure writer RM Ballantyne. Browse content similar to Chichester Cathedral. Check below for episodes and series from the same categories and more! Glean a rich harvest here. the way they did it in ancient Greece. is a tradition honoured again when the festival opens its doors from April to October. Chichester Cathedral has drawn us back today. still attracts thousands of modern pilgrims. having been twice destroyed by fire. and restoring it took 100 years and a huge amount of money. and is now unique in England. So here we are in the welcoming depths of Chichester's cathedral. Let's join our choir of experts. -Let's take it out. You know it's a covered bed? Oh, yes, I slept on it. For how long? -From about five to about 35. 30 years on it. -So you couldn't fold it up? I suspect that the original user of this was probably a servant. -..so that it could be folded up and put away. Yes, put away during the day. It's amazing to see one of these with their original bed. Mostly, they've been dismantled. -Let's put it away. It's very beautifully but simply made, isn't it? It's held together with these leather strap hinges. These wedge-shaped bits of framework block it all into position and make it very secure. Right, when do you think it was made originally? I think it could be up to 200 years old. It IS about 200 years old, between 1810 and 1820, something like that. It's certainly English and was made somewhere in the countryside. It's not a London-made piece. -That's where you used it? -No, my mother was a Norfolk person. And she brought it from Norfolk to Sussex when they were married. and turning it into a piece of furniture with a very definite modern use, ie a television cabinet. -into this piece, but then you've lost its original insides. It would be a very sad thing to do, but in pounds, shillings and pence terms, that's where its value is. £500, £600 - not a fortune, given how interesting it is. It's the amount of use and money that needs to be spent on it that limits its value. Anyway, jolly nice to see it, and I'm pleased to have met somebody who's slept on one of these things. You get no draught round the head! -The pillow doesn't fall off the back either. You've got so many of these, but you don't know what they are! I've got an idea they are Japanese. Um, they could be Mandarin buttons. Mandarin buttons - I don't think we get Mandarins in Japan. -I bought them when I was in my 20s. And may I ask how long ago that was? -You bought these in your 20s. -Good time to buy. What did you pay? -OK, well, I'm going to tell you what they are. -They're kagamibuta - a form of netsuke. or a little box called an inro from it. But these served another function. You tap out the contents of your pipe into it, so it was an ashtray. Now, the Japanese, when they smoke a pipe, they have a tiny little bowl, only about that big. smoke it in one puff and then tap it out into one of these. which has been stained and inlaid. On the base we've got another very well carved shishi and a signature. they're all the same sort of date. They're mid-19th century. This one's going to be worth more than the £2 you paid for it. -We're looking at an average price of around £200 or £300. This one, £1,000 to £1,500. -You have a very good eye. -Thank you. I've enjoyed it. -How long have you had this for? because it was a wedding present. -So you've been married for over 50 years. It's a very fashionable, popular object these days. Made of tortoiseshell, veneered in a very nice casket form. and the servants were not allowed access, so the lady of the house had the key. you could have a selection of tea. and then put it into your teapot. Velvet lined at the top. -These are made of ivory. They're fragile, so it's nice to see them here. And you're still using it. You have got tea bags in there that fit absolutely perfectly. because usually, they're just a decoration. -because it will take the nice patina off the tortoiseshell. Because it's quite a valuable thing. Well, yes. That IS a lot of money! It's a lovely dish - massive thing! but splendid and intended to be a hanging plaque. You've got these little holes for hanging it. This is safe and strong, cos it's massive. How long have you had it? Watteau, the name of the pattern and Doulton, the factory who made it. -that Doulton bought up in the 1880s. Pinder Bourne. Doulton bought up Pinder Bourne. -so they put the print on it. Made in 1881 and it's splendid, isn't it? -You like it, do you? -but the pleasure of the pot is more than value. This is charming. Look at that page. Her bleeding heart, I assume, and things like that. but actually an original manuscript. Shorthand on one side, yes. ..the little texts with the puzzles and the beautiful little drawings. But it's a wonderful way to teach children. "Stand that friends must part." "Something fade and so must you and I." -I presume the answer is on this side. I don't know shorthand, I'm just guessing. -Looking at the binding, there's not much left of the spine to it, but that can be repaired. I think it ought to be tidied up. Here is a date - wonderful date on the end - 1694. -Um, possibly the shorthand was added later as a further exercise. But that's the beauty of these books, and this one is so pretty. I wouldn't be surprised if you could see this at £2,000. Oh, God! -Possibly more, but I think that would be conservative. Somebody would look and say, "It's a silly old child's book, it's dirty." -It's colourful, it's beautiful, it's clever. This is my grandmother and she gave the necklace to my elder sister. -So that would date from when? which is a very interesting design. who made silver jewellery in the Arts and Crafts and Art Nouveau style. which tend to be rather geometric. -It's silver. The stones are amethysts. My sister's always worried the clasp could come undone. You could put a safety chain on it. -of somewhere in the £1,000 to £1,200 range. over the time we've had it in the family. -It's obviously been looked after. Because it is a little treasure. -What year is this photograph? -1902 - it shows my grandfather's house. and here it is 100 years later. Documentary evidence, wonderful. on the inside, it's a cobalt colour. which is a bit like a butterfly's wing. In fact, Loetz called this papillon glass. having covered the areas where they didn't want the glass to anneal. to prevent the actual silver building up in those specific areas. for the decorator then to trim away and then carve in the decoration. -It's just such a sensual pot. It's shaped like Mae West! and top technology to bring all these elements together. you should have this feature, which is a ground pontil mark. snapped off and then it's polished away. It's always a sign of quality on any type of glassware. So we've got to come to terms with...with value. -but if it was mine, I'd be insuring this for at least £1,500. It's been a treasure in the home ever since I can remember. This is a wonderful collection of miniature tools. My father actually made it. -and he made all the pieces gradually over the years. this is a spirit level. Wonderful detail on the brass, there. they are all in working order. -So do you have a particular favourite or not? -I think the plane's quite nice. -Oh, yes, a miniature plane here. -It's got a blade in, underneath. How long would it have taken him to make a single one, do you think? It probably took him about a month, I suppose. -A labour of love, and he just did it as a hobby. Yes, a pair of shears I see here. Again, they work terrifically well. -A bow saw. They're almost all made of brass. -That was his favourite metal? -It was a relaxation, although almost a busman's holiday for him. A terrific craftsman. He made most of them when? In the '50s and '60s? Yeah, yeah, up until probably about the mid '70s, I suppose. Individually, they're not of great value. But I would think, as a collection, they must be worth £1,500 to £2,000. -Thank you for looking at them. It's a lovely collection of portrait miniatures. How did you come by this lot? and he left them all to my mother. -And, er, there was a larger collection. and in turns, one, then my sister and then my brother took one, so unfortunately some are split. I like that one and I particularly like that one as well, it's lovely. I love the beautiful gowns and the colours of it. -I just think they're pretty. I hoped you might pick this one - the frame is made up of piano keys. -And it's all made up to look like an old miniature. This is not a rare miniature, but it's very pretty. And you've got here something which is quite out of the range. -Were there other oil paintings? -Not that I'm aware of. except for the two on porcelain. probably northern European, about 1740. It's the earliest of the pictures. -I can't value what your brothers and sisters have. are still worth £150 to £200 for that one. are going to be worth £500 or £600 each. It's a substantial lot, so it must have been a great collection. round about 1800, Regency period. Where did you get it? Was it something you bought? It was a clock my grandfather bought, I believe, in Croydon. and he used to pop across there and buy things. was descended from Huguenot origins. Two dials at the top there. The one on the left is numbered up to 31 - that's a calendar dial. The one on the right is numbered 0 to 60. You wonder what that is - not a seconds hand. We'll come back to that in a moment. Look at the back plate. You've quite correctly put the pendulum in there for travelling. -If we release that, away comes the pendulum and away it will tick. Back to that dial, that mechanism on the dial which is numbered 0 to 60. Have you seen what happens when you turn it round? -You look at the back there. -Look at the top of the pendulum. Can you see what's happening? -It's rising and falling - this is called a rise-and-fall mechanism. And it's for the fine adjustment of time keeping. -In other words, you can make the pendulum shorter or longer by that. But you have to physically turn the handle, turn the dial on the front? Yes, you can do that when the clock is working. You don't have to stop the clock. so to make a clock go fast, you make the pendulum shorter. a very lovely clock. Have you ever carried it by that handle? -Good, good! I'll say straight away, "Good!" ..Don't! but now the case is 200 years old, the glue's getting a bit dry. You pick it up one day, it'll make a lovely noise as it hits the floor! So always carry it from underneath. would fetch certainly £3,500. Maybe £4,500. somewhat more. It's a £5,000 to £6,000 clock. -A lovely clock indeed. Beautiful in every way. quite liked it, knew nothing about it, and bought it in the Kings Road, Chelsea. you tend to have this reliance on simple shapes, on some classical decoration. which is more than you find on some Biedermeier pieces. but it spreads more than that - 1815 to 1848, that sort of period. which has no carving at all. And also, these sort of lozenge-shaped drawers, which are very bold, very geometrical. and has this, I think, really lovely secretaire drawer inside. It pulls down like that. which is also quite bold and dramatic on the inside. But on the outside, you also have this use of symmetrical veneers. so it works on a key, which isn't the most practical thing, I suppose. They're heavy to pull out once they're full. Very heavy. Such things now aren't tremendously fashionable in this country. -They're much more fashionable on the Continent. What did you pay for it? -Which was not nothing, then! -which doesn't seem a lot for an extremely attractive piece. -Well, it's a good profit! We're talking plunder here, aren't we? Tell us about this dish. and loss of life was nearly 50. The captain, also. some glass and some cotton. -And where was it heading for? -It was on its way to Madras and the china was picked up in Antwerp. It wasn't hugely valuable at the time. It was day-to-day types of stuff. And how much has been recovered? Over the years - since 1989 - quite a considerable amount of this has been recovered. -And who is doing the recovering? -A lot of it is done by sports divers. You'd think the story would make it very valuable, wouldn't you? Yes, but it's not hugely valuable. but it's got local interest to us - that's what we like about it. They were done by my grandmother in the 1910s and 1920s. Put that on there... And lovely dresses here. There must be about 50 or 60 dresses. Yes, I remember as a child that I was allowed to play with them on high days and holidays. -And, um...that I've always treasured them. They were given to me when I was a teenager. and they're all hand-drawn and they're all coloured in with watercolour. -apparently for somebody called Raymonde - Raymonde somebody. Well, I don't know if it's male or female, but that's all I know. and whether she really did design anything that was worthwhile. You'd have to go to a fashion museum, or a fashion design museum. ..and see what literature they've got and whether, in fact, they can trace him - or her - back. -But I think all of these are obviously, obviously good designs. This one's interesting, because it's almost contemporary, isn't it? but also with a contemporary tattoo. -No, well, she was a bit of a girl, I think, in her day. So a fabulous collection of costume design of the 1920s. Very hard to value, but I would have thought between £500 and £1,000. and just about the prettiest sort of work that was done around the start of the century. -ever had anything to do with that. -so I don't think it ever went together at all. These were made abroad. And this one's got an import mark. but they've got all this beautiful enamelling and it's all engine-turned underneath. so that you get this lovely play of light through the enamel. It's just a delightful little miniature carriage clock. and of course this for scent. Really charming and delightful. Very difficult to do this type of enamelling so beautifully. and the other pieces are of a similar period. the £1,500 to £2,000 mark. -What, for that little clock?! -I would say is probably another £1,500 to £2,000. I know he's English because I looked him up. An English artist. -What else did you discover about him? -That he exhibited a lot. and largely socially, because he taught the Queen how to paint. -and that, of course, takes you a very long way in Victorian society, as you might imagine. I wouldn't say that he's one of England's greatest watercolourists. that you can see very easily in this watercolour. -Isn't it a very lively little picture? -Was it painted in Holland or here? -It looks more Dutch to me. which is quite a nice figure for a little thing like that. A wonderful set from 1790. These are carefully-designed botanical drawings. were taken from the Botanical Magazine. -..with different illustrations of wonderful flowers drawn by Curtis. And the pottery factories would acquire the books and copy the designs onto them. Lovely specimen! It's always labelled clearly on the back of it. Yellow-flowered dog's-tooth violet. They were an education in botany. -You'd learn your flowers from looking at the service. Many potteries, especially in Staffordshire, produced these sets. because they're whiter pottery. Leeds was creamier. -It's had a bit of a hard life, hasn't it? -and we had a bomb 50 yards from the house and they got a bit chipped then. -So a bit chipped further. Nowadays, usually these sets are split up, which is a sad thing. and you've got here 11 plates, even with some damaged. I shall have to be more careful with it! Thank you very much. It's my late husband's maternal grandparents'. -I believe it was a wedding gift. Well, I've seen a number of these over the years. ..for picnicking in the grand style! it's the engineering - that they managed to get so much into such a wonderful compact basket. So let's just take a piece out. I've ever seen with silver fittings inside. and the date letter for 1900, so was that when they were married? I don't exactly know, but all I know is their first child was born in 1904, so it would be about then. to have them made in silver. Just look at the quality of this kettle here. "Remove this lid, also cap from the spout before lighting lamp. Drew & Sons." at the late 19th century, early 20th century, and specialised in making these sort of things. And, um...what I particularly like is attention to detail. -just the way they slot into these little holders! You know, they really thought about doing everything in great style. -The spoon has got a small chip in it. -but we can forgive it that because at least it's still here! -It sits in a cabinet. -Well, that's where it belongs nowadays. -And the fence pattern - a popular pattern. Well-made, beautiful condition, nicely-made little object. -with a chip, about £800. We've got more... more treasures inside. and this is probably for sugar. -"Drew & Sons en route..." I like that! This is...a rarity. A great rarity in superb condition. -That's what collectors like. That's what buyers like. Some of them go back to Queen Victoria's Golden Jubilee in 1887. -no way have they proved a good investment. ..with a plate for the Golden Jubilee. and she said, "Should I keep this as an investment?" -I said, "Don't think of it on those terms." -"That is not the point. "The point is - do you like it?" "Oh, yes. I like it." Well, that's what it's all about. through the coronation of George V.
Edward VII. We've got three of Edward VIII. Why three? and I asked him if he was interested. He said, "Oh, yes. I'd like to buy those." Right. ..Well, this is, I think, the nicest one, really. It goes all the way round. The date - May 12th, 1937. "A perpetual souvenir..." Well, only if you didn't drop it! "..in Paragon china". Paragon was a good factory, in fact. -I thought that was just pretty! -And we just like them. -They're good quality. That's what sets THESE aside from those. -And if one is buying commemoratives, always go for the best quality that you can find. This is quite remarkable - I can hardly believe it's walked in here! of RM Ballantyne's "The Lighthouse". Explain yourself! and the keeper of the muniments in Westminster Abbey. -Good heavens! My old alma mater! -I sang in the choir there. But this is quite remarkable. He was born at the beginning of the 19th century in 1825. He died towards the end in 1894.
was to work for the Hudson Bay Fur Company. from Canada. But The Lighthouse is actually set in Scotland, isn't it? -It's set off the coast of Forfarshire, or somewhere like that. But this is very exciting! -I'm going to say £8,000 to £10,000. -Well, I AM! I think that's wonderful. And now I think I'll have a stroll around the cloisters, so from Chichester Cathedral, goodbye. 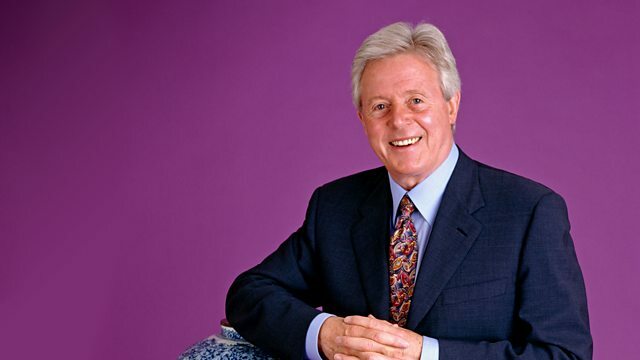 Michael Aspel's team of experts assess antiques brought for scrutiny by the public. They're excited to see an original manuscript by 19th-century adventure writer RM Ballantyne, as well as continental furniture and glass, a rare mustard spoon and a silver picnic set. Plus a trip to Chichester Cathedral.